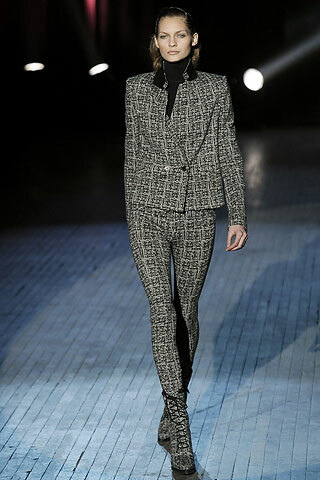 Tailored suits at Alex Wang, who would have thought? Like what he said pre-show, it’s about ‘growing up’. Thanks to to his win at the CFDA/Vogue fashion fund, he included expensive materials that many other younger designers can’t afford — fur, croc skin… and new accessories. Many supermodels came out of semi-retirement to walk the show too. And his guests— SJP, Anna Wintour, Bee Schaffer— impressive. It’s good to be Wang. Besides the support, he has the freedom to literally play in his own ground. In New York, he owns the rebellion field, his clothes are targeted at just this specific group of edgy young fashionistas. Whatever he does, whether you think it’s beautiful or hideous, it naturally stands out from many many other collections. But to be honest, this showing is a little disappointing. There is so much potential for it to be a great one. The hoopla that he has received over the past year, in such a short period of time, is forcing him to change in a bad way. I would rather see the old Wang. Why can’t he stay true to his aesthetics while freshening and maturing his signature look? In the end of the day, he is talented for his age and the label is still very young but people have to judge him in the Marc Jacobs level already. There is still a lot more collections from him to come so let’s wait and see. I even prefered his Pre Fall collection but yes, I agree, he’s too young and I don’t know if the attention he’s getting from everybody and the CFDA Award are putting too much pressure on him… You said it: Let’s wait and see!